Part of our Twister series, this yellow pad starts the polishing step in the restoration process. The pad is 1500 grit and has micro diamonds in the pad to bring out the initial luster in your floor. This prepares the surface for the 3000 grit green Twister pad which adds a high gloss polish in the final step of the restoration. White and red pads should be used prior to the yellow pad to buff out any scratches and stains that your floors may have. 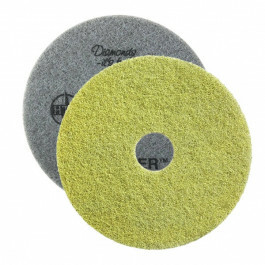 Like the green pad, these yellow pads can be used with water on a low speed machine (up to 350 rpms), or used dry on high speed machines (up to 3000 rpms). Made with micro diamonds, the Twister series of pads clean and polish your floor at the same time. Since these diamonds do the work, prepping your floors with these pads require no chemicals and can be used with just water. Thanks to this, the pads will produce excellent and lasting results while also being environmentally friendly and saving you money. The using these pads will create a safer surface on your concrete, terrazzo, marble, and vinyl floors by increasing slip resistance as well as a resistance to dirt and wear. These pads can be used on any machine that are equipped to use regular pads since it doesn’t require any extra equipment to attach. Since restoring your floor requires 4 separate pads, we have created an easy starter package so you can be fully prepared when starting your floor restoration. If you own a round buffer, please look at our rectangular Twister yellow pads. 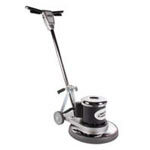 For use on floor buffers up to 3000 rpms. Use with water. No chemicals need! Cleaner and safer for the environment. Made with microscopic diamonds to clean and polish the floor at the same time. Daily use of Twister pads will produce a glossy, mechanically densified surface that have increased resistance to dirt and wear. Pads fit will fit on floor buffers without need for new equipment. The Life span of Twister pads is three times that of a traditional floor cleaning pad. Pads should only be only be used colored side down. Please replace when the backing starts to show through.